This week we've had VBS every night. I'm the snack lady. It's what I do every year. But what a visible representation of God's fingerprints, on all the kids and hard workers. 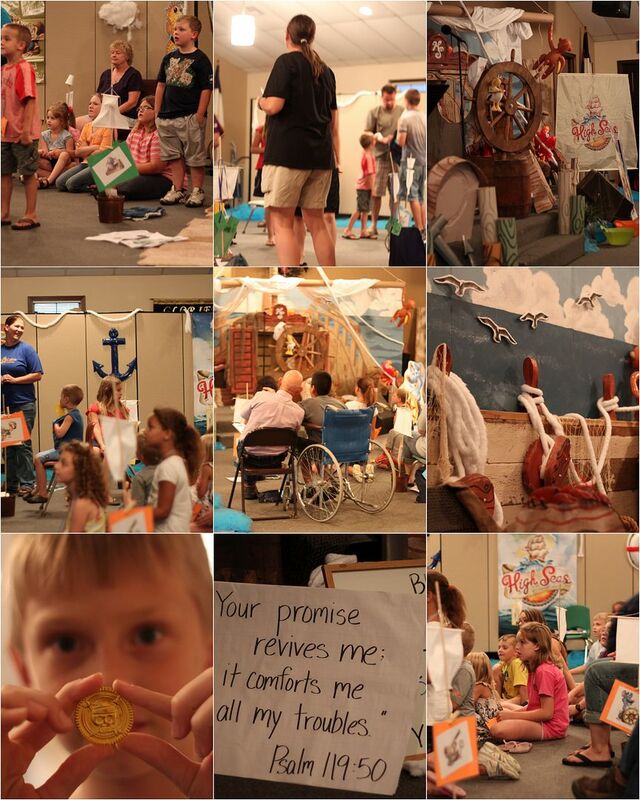 Every time I hear anyone talk about VBS, I only hear good things and how God works in amazing ways. I'm glad your kids could be involved!! Hey Beki! Looks like you guys had High Seas Adventure too! That's exactly what where my blog's inspiration is from! My grandson loves to draw pirate ships! We had a huge one built by a church member to be displayed during VBS. The kids will NEVER forget it! don't know what VBS is but it looks bright and happy! and as for bagging the job as the snack lady, well done. What a wonderful thing for children and a lot of fun..Great Fingerprint..Every snack you do/you gain another star in heaven.. I've blogged every year about what a great Fingerprint VBS is! The workers all deserve a special place in Heaven with extra *sparklies* on their crowns. i was the snack lady at our VBS too and you are so right it is exhausting!! What a blessing though that you are available to serve! Looks like a happy bunch of kids learning about Jesus! I loved Vacation Bible School when I was a kid and as a teenager I helped teach it. As an adult, I used to help with crafts. We don't have it at our church and I kind of miss it. Instead, we use the AWANA program all year. The kids love it and all of the volunteers do to.